Loise will graduate Uhuru Academy in 2018. She lives with her mom and her two siblings in a slum called Osreian Village in a rented home. At home, she loves to read storybooks and help her mom with chores, specifically washing dishes. Loise is a talented mathematician with a dream of becoming an accountant. She also finds history to be a fascinating subject. Her favorite topic to study in history class is the early man (she thinks that it is very strange that they used to dig holes with sticks). Loise is a very happy and humble young girl. 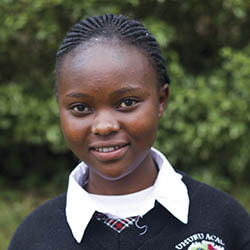 Click here to sponsor a student like Loise.